Stonegate proved to be tiny with little more than a room containing the sceptre so I was starting Shame within minutes. This was a typical dungeon and it didn’t take long to make my way to the field around Doom. I’ll confess that this had me stumped for a while when using the amulet on it didn’t make the field vanish. It turns out I had to fly through it on the magic carpet? Not sure if this was intentional or a bug. It was nightmarish on the PC but this version of dungeon Doom isn’t difficult as such. There are some fields at the start which can only be cleared with the sceptre but it’s more of the same after that. The path goes up and down more frequently between levels than any other dungeon but this meant that there was often only one choice of direction so it’s just a case of perseverance. Right at the bottom of the dungeon is a small empty house. After a bit of trial and error I figure out to use the sandalwood box on the mirror. Not sure if there was a clue for this somewhere along the way but I would certainly hope so as this wasn’t obvious without prior knowledge. I never did seek out Captain Johne on this playthrough and there was a demon in Stonegate who refused to help me out without the information I would have got from him. There is a short ending sequence which is true to the original with regard to the banishment of Blackthorn although here it’s watched by the Avatar in person. 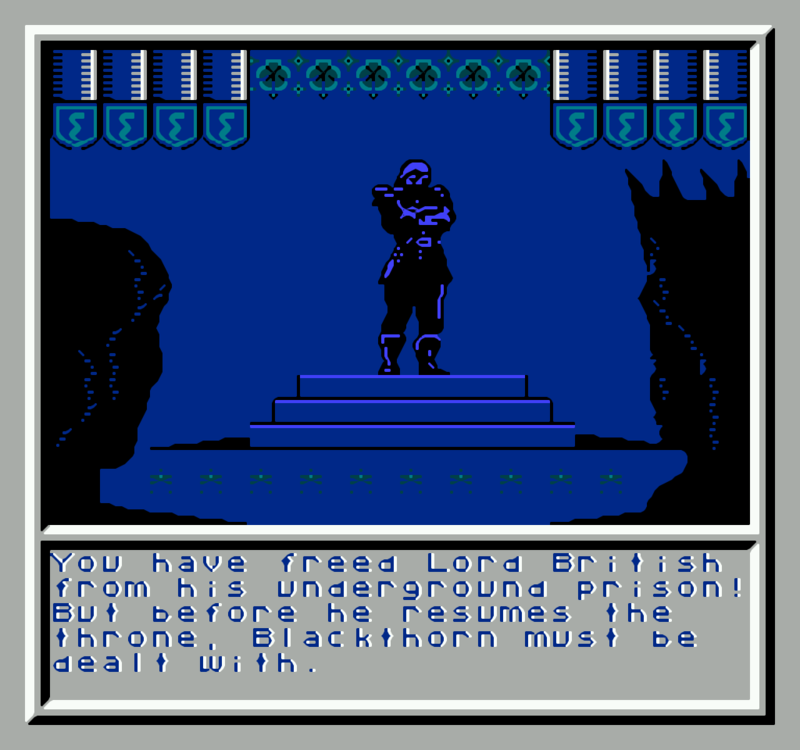 In the original of course, the Avatar was sent home in the same spell that transported Lord British from his prison only to receive an ignominious homecoming and discover that his house had been burgled in his absence. On the NES he is rewarded with a banquet in his honour first. Indeed! 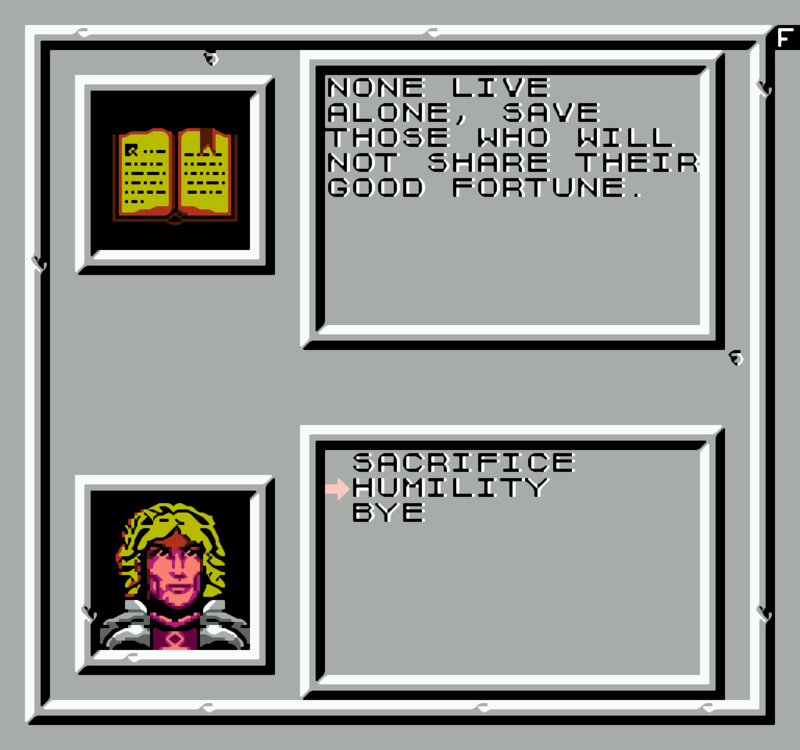 So that’s Ultima 5 on the NES done at last. 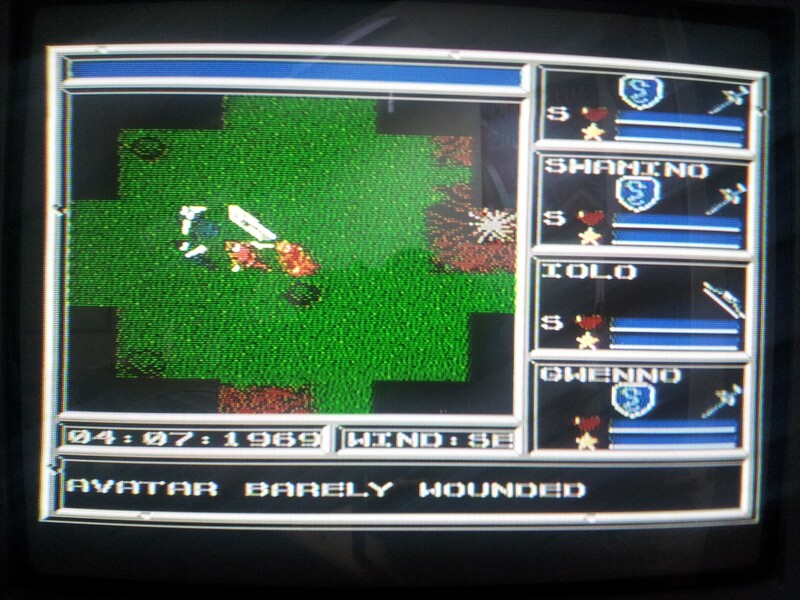 Escape From Mount Drash aside, it’s easily the worst Ultima I’ve played on any platform. Definitely not as bad as I feared going into it but not one that should be tackled by any but the most (fool? )hardy of Ultima fans. 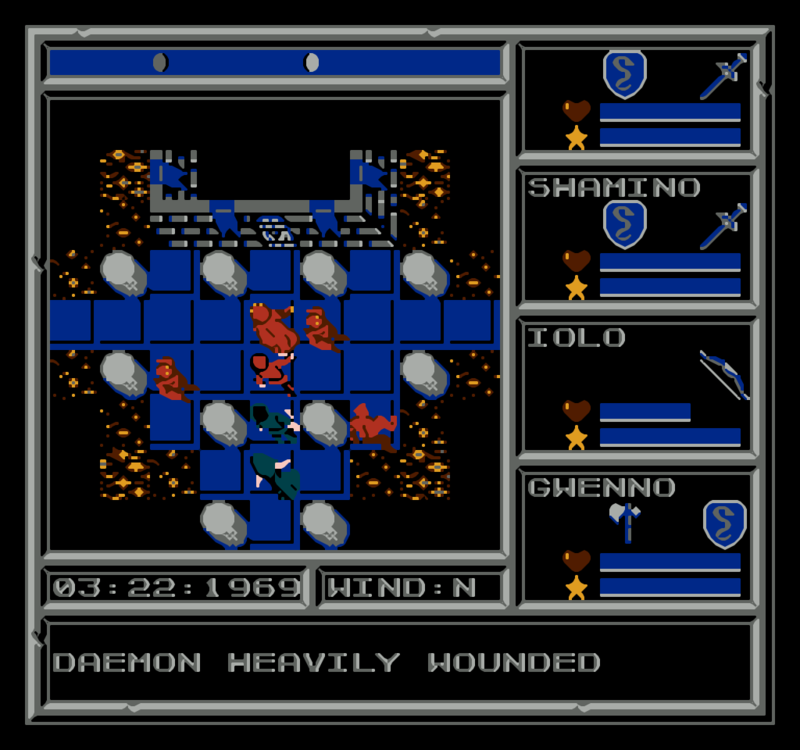 The series moved to the SNES for Ultima 6 which should prove to be a big improvement. The scan is courtesy of Sierra Gamers run by Ken and Roberta themselves who have a full archive of Interactions on their site. 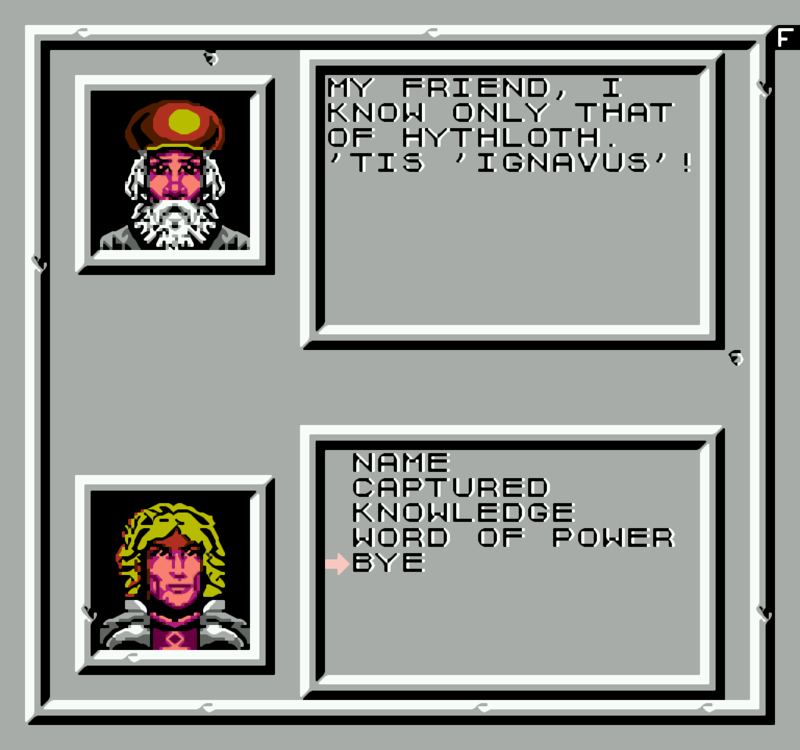 Curious to see an admission that Sierra didn’t treat Garriott all that well at the time. 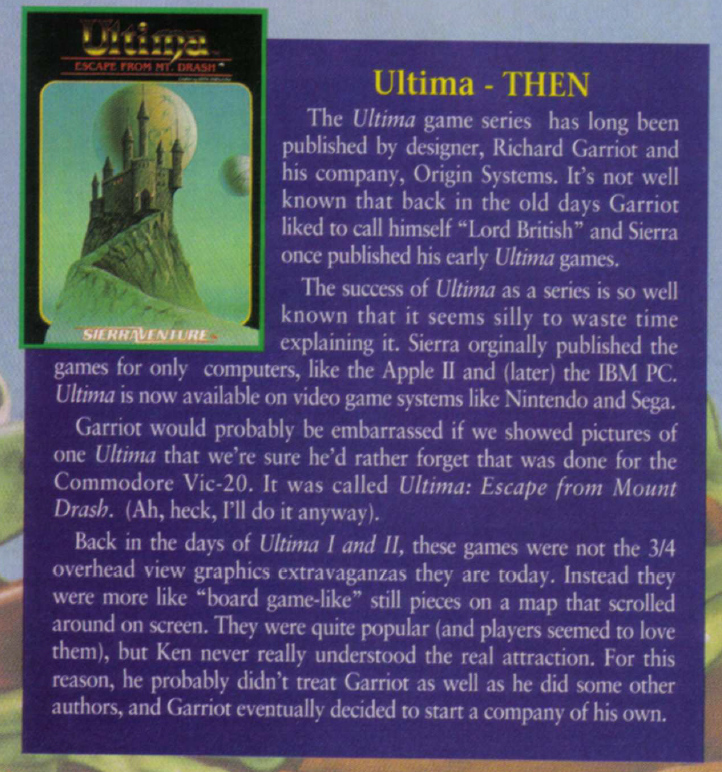 There must have been some regret at this stage about letting the series go but I’m sure there was more to it than Ken Williams not liking RPG’s with the main grievance being the royalties on ports of Ultima 2 as I understand it. If Richard and Ken had got on better, Origin would never have been formed of course so it turned out well enough for us gamers in the end. I’ll finish off with a quick plug for Retro Revival which I’m off to tomorrow. It sounds like more retro gaming under one roof than I can fit into one day but I’ll be giving it my best shot. When I last posted about this game I’d come to an abrupt halt when one of the dungeon ladders went missing. At the time I wasn’t too keen to try again as I’d been playing most nights for a week to get that far. However, I wouldn’t be doing this blog without a stubborn/obsessive streak which took over a week or so later and I decided I should give it another go. That still didn’t mean I was all that keen and it’s taken long enough since for me to get back to it. I’m now playing on a NES emulator and at 2x speed the game has proved to be a lot more playable than it was on real hardware. At this speed, the controls aren’t always especially responsive but movement is much improved and it’s a lot more like the sort of speed an Ultima should play at. Retracing my steps was still a largely mechanical process but at least I knew what needed to be done this time around. I headed down through Covetous to get the mystic arms at the first opportunity before getting back to relearning all the mantras. Something I didn’t try first time around was taking on more than one shrine quest at a time. I’m sure this wasn’t an option on the PC but after finding it worked here I only made two trips to the Codex which saved ages. What I really wanted to do was head into Deceit and see if my missing ladder would show up this time around and I’m relieved to say that it did. After putting off the replay for so long, I had a maxed out party and the first of the shards after maybe 2 and a half hours. That’s a lot of retracing but better than I thought it was going to be and it could have been a lot worse. 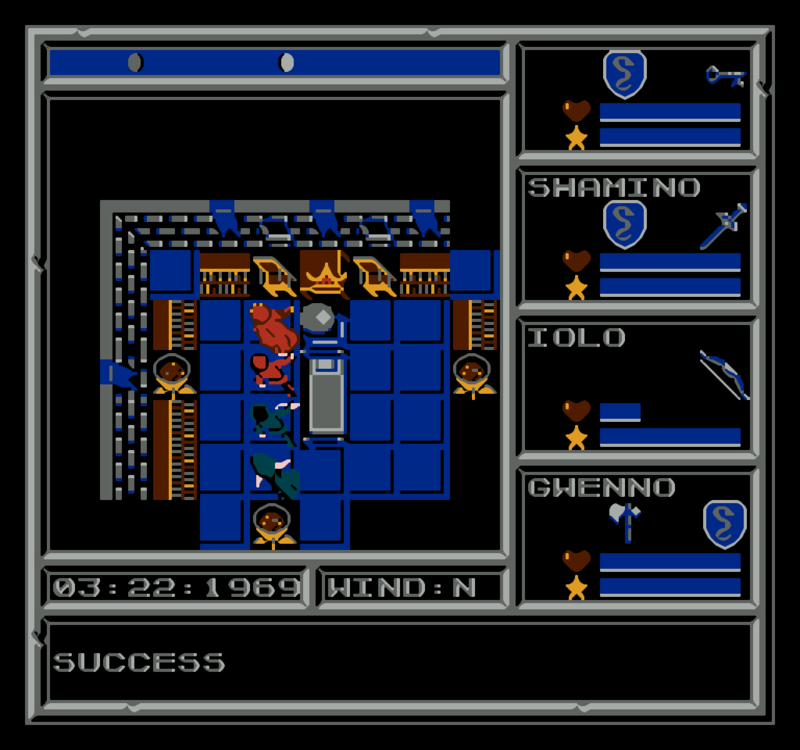 From what I remember of Knights Of Legend, it near took that long just to get between save points. I found that I was still missing the Hythloth dungeon password. One of the few places I’d not explored was Blackthorn’s palace which seemed like a likely spot so I headed there next. I was curious to see how this version would handle the encounter with Blackthorn. 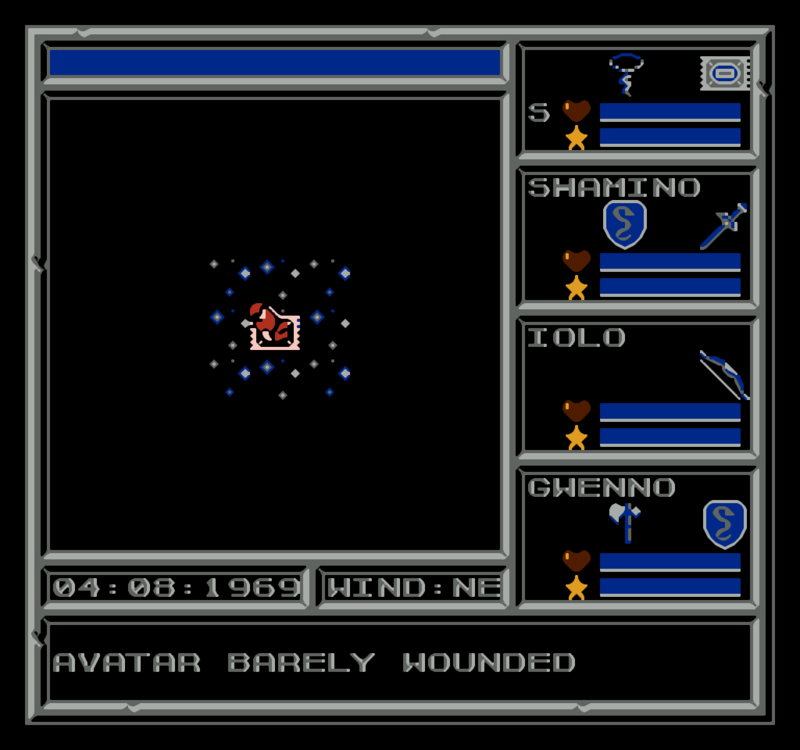 In the original release, Blackthorn would permanently kill off one of your party if you weren’t a member of the Oppression. His actions are less drastic here and he sets 4 demons on us instead when I can’t provide the password. 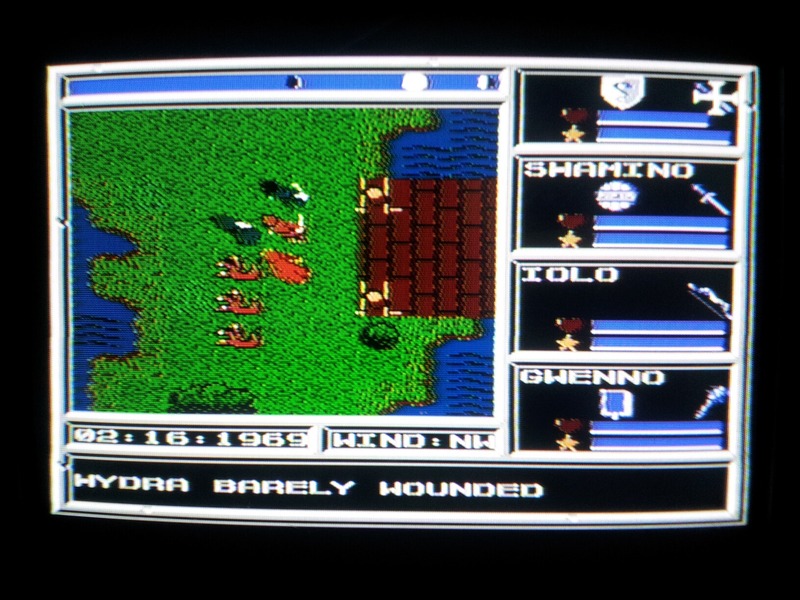 At this part of the game it didn’t slow my group down a whole lot and I had free rein to explore after this. I take the opportunity to grab Lord British’s crown and find the last member of the council languishing in the prisons who provides the needed word of power. 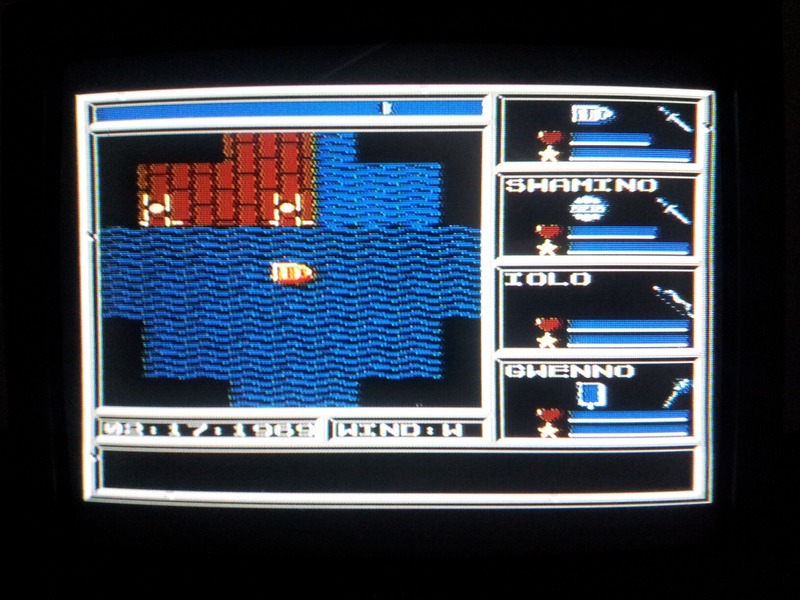 After this it’s been nearly all dungeon crawling. 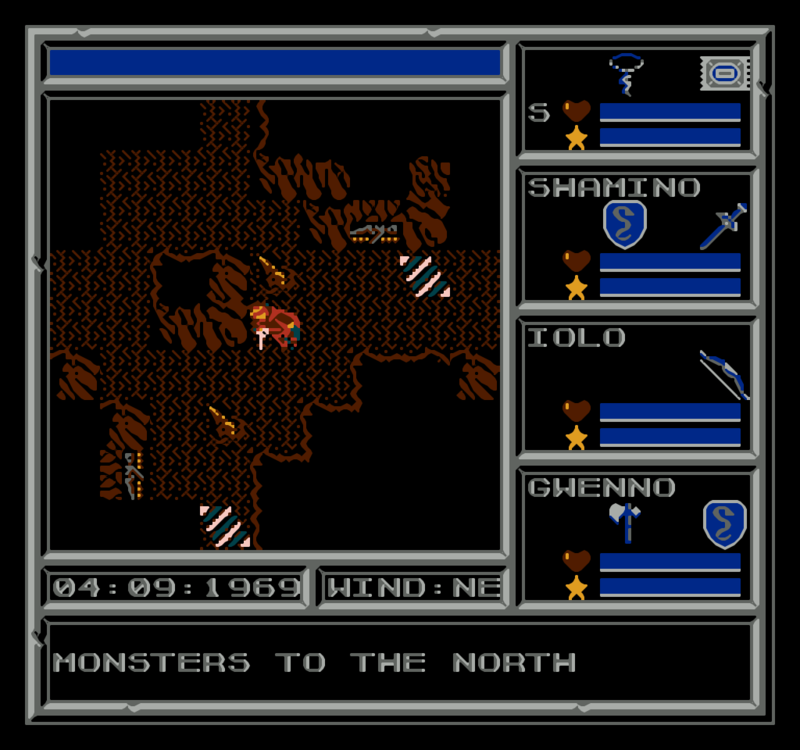 The dungeons can get extremely convoluted with many routes requiring constant swapping between floors but having a full set of maps before you even start the game makes it all very easy. 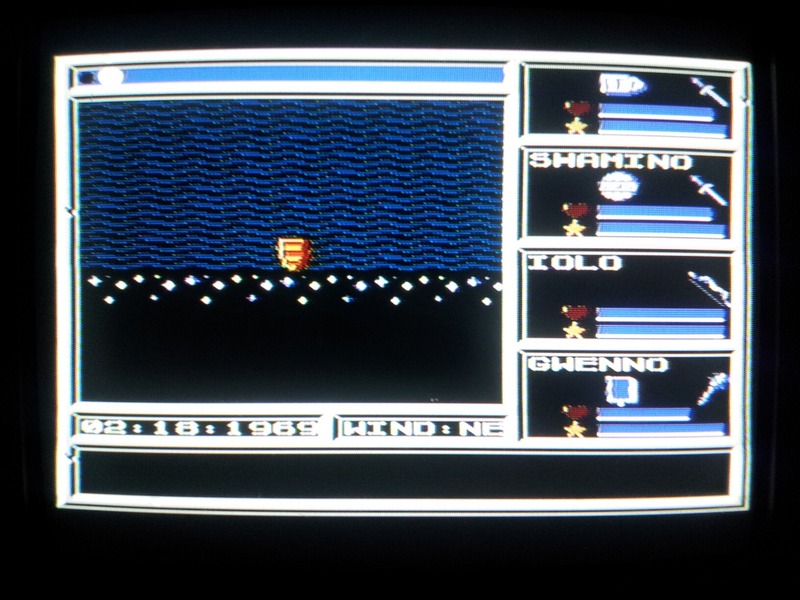 It didn’t take too long to retrieve all the gems, banish the Shadowlords and grab the amulet. The lack of challenge is something that’s really hit home playing this second time around. Combined with the lacklustre dialog and slow movement speed all the life has been sucked out of the original classic. What’s left is a game that requires so little thought that it can be played on autopilot while watching a movie – not a good sign when I’ve got it running at double speed. Having said that, the gameplay is inoffensive and not that bad a time killer once that extra distraction is thrown in to keep your brain otherwise occupied. It’s just as well as even with maps, the dungeons are large enough that it’s taken me about another 90 minutes to get this far but all I have to do now is raid Stonegate and then head down through the final pair of dungeons. 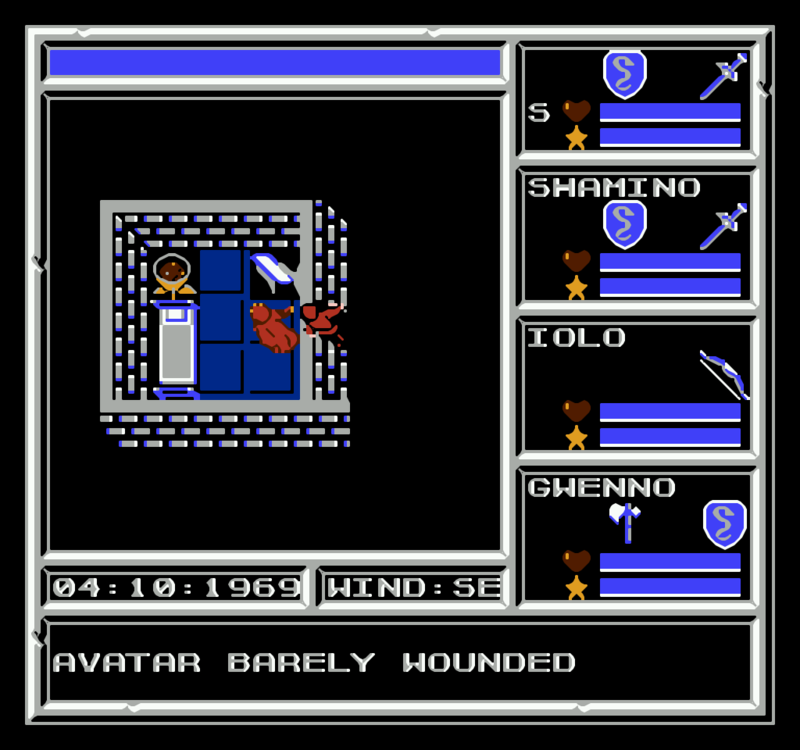 The first dungeon I decided to tackle was Covetous due to it supposedly having the Avatar’s Arms at the bottom of it which sounded like they would be just the ticket for exploring the depths. The dungeons turned out to be quite large despite the move to 2D and I didn’t get the impression I was being short changed by the dropping of 1st person perspective and missing floors. They aren’t especially visually interesting of course but the maps sped me through them and I didn’t spend a lot of time exploring. The maps don’t show the exit to the underworld on the bottom floor so I had to stumble into that myself but it was reasonably easy to guess. The underworld is lush,green and not all that dangerous making it quite the different experience to what I remember. From the few sections I’ve been to so far, each dungeon has is own little independent underworld with no blinking required (or even possible) to get around the map. Each dungeons underworld section just had one area of interest which I’d stumble across after a bit of aimless wandering. 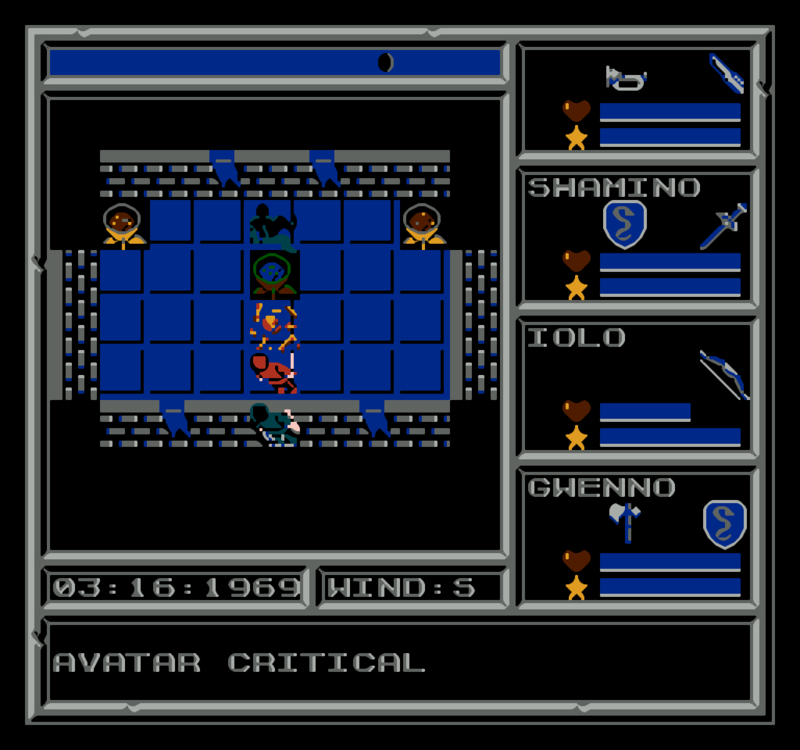 The picture above shows the Avatar’s Arms which were full sets of magic shields + armour for the party with a magic bow, axe and sword thrown in. These made my party more or less invulnerable and my Avatar could take down near enough anything in a single hit with a magic sword. I should definitely have come down here much, much sooner. I thought I’d sell off some spares and ran into another strange quirk with this game in that merchants will only buy very specific items of armour or weapons so none of them were interested in any of the better items I’d found. Gold is strangely difficult to come across as monsters don’t drop any either meaning that the only source is the stock piles in dungeons as far as I can see. It would probably be quite easy to get into a position where you had spent all the gold in the world with this system. A side effect of the above problem is the lack of inventory space which is a fair enough constraint except it’s only possible to discard and not drop items in a cache somewhere. I didn’t try it but I presume it would be all too easy to make the game unwinnable in this way. Now I was well armed, I headed for another dungeon to start collecting shards. 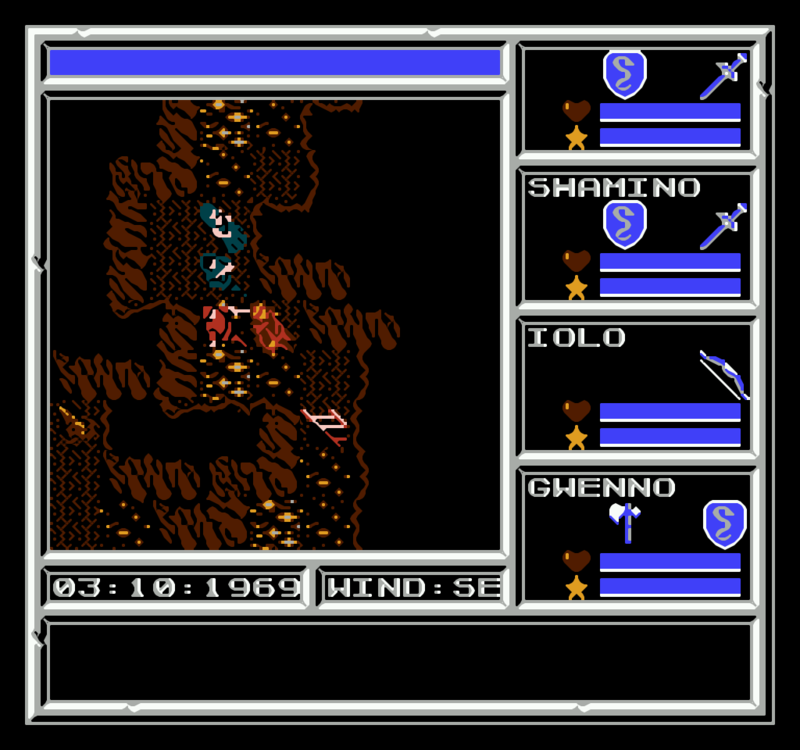 The first of these went without a hitch and I killed off the appropriate Shadowlord at Empath Abbey.This scene was more than a little anticlimactic on the NES but headed for Deceit to fetch shard #2. This is where it all went strangely wrong. I followed my map taking a route which went down to floor 2 then back up to floor 1 in a separate area and then followed this to where there should be a ladder back down (the rightmost brown square on the screenshot above) and there was no ladder! I searched the whole level looking for an alternative unsuccessfully. I then watched the appropriate bit of the playthrough on Youtube to see what they had done and the ladder was there exactly where I’d been looking. I’m entirely out of ideas at this point – no ladder means the game is uncompletable so this attempt to play the game has come to a grinding halt without any other suggestions. If anyone has run into this before and/or knows what I can do to fix it please let me know. I’m suspecting there must have been a bug in some versions of the cartridge at this point but maybe a certain conversation will make it appear? It would have been nice to finish having got so far but I’m not going to miss playing the rest of the game too much in all honesty. I dare say I could speed through it considerably quicker if I were to ever try again on emulation now that I know the ropes. but I’m not too anxious to do that either right now. I don’t think this port is as awful as I’d heard but it doesn’t have much to recommend it. 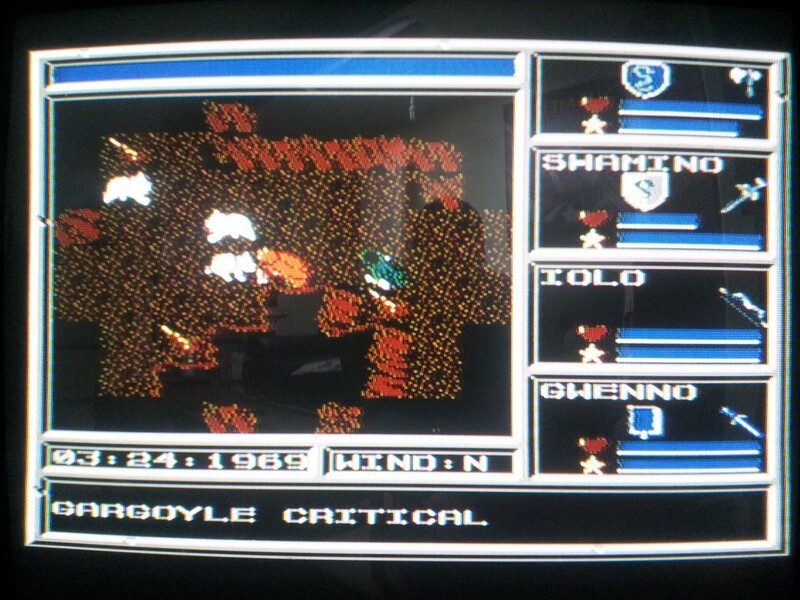 Every criticism I’ve got seems to be down to a lack of space and power on the NES. If this porting to U6 had been done on the SNES it could easily have ended up being the definitive version of the game so it’s a real missed opportunity in my eyes. We do have Lazarus however which I still have to play for myself and will surely get around to one of these days. 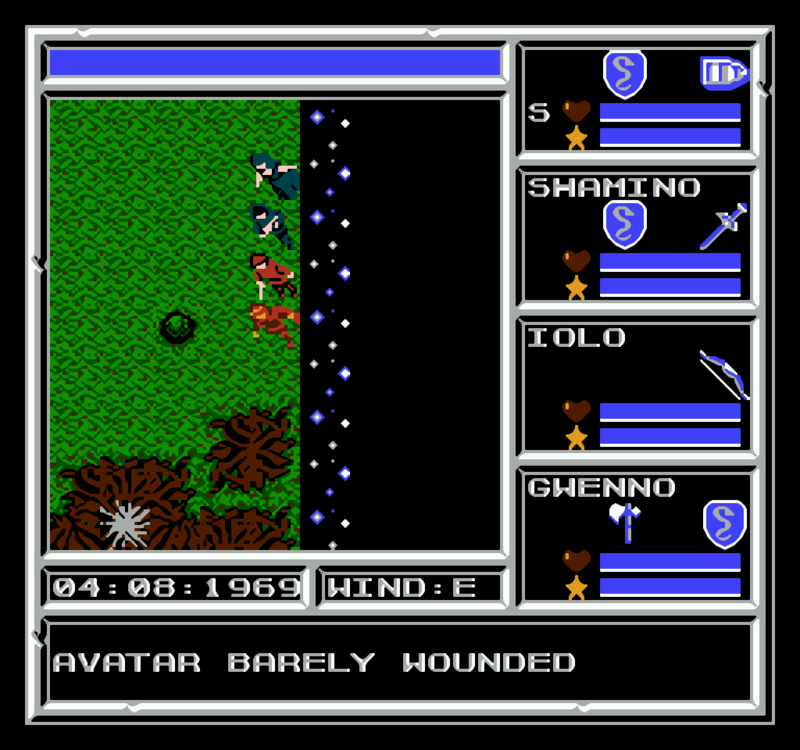 I’ve been getting in the occasional hour or two on Ultima 5 over the last week but this will be a short post as there isn’t much to say about it. There is a lot less to do in this Britannia than I’m used to and I’ve spent most of my time travelling to and fro from the shrines and codex completing the various quests. I’m glad to say that I’ve now achieved all of these but it took a while. I know the game a whole lot better now and have been fully exploring all the towns as I go. There isn’t much going on in any of them with the most extreme example being Jhelom which looked to have a population of 2. The residents do have some basic schedules at least but they don’t move around in the usual sense and appear to teleport when I’m not looking. Finding the clues needed in the towns is pathetically easy and the story of the game is seriously lacking to the extent of being almost non-existant. 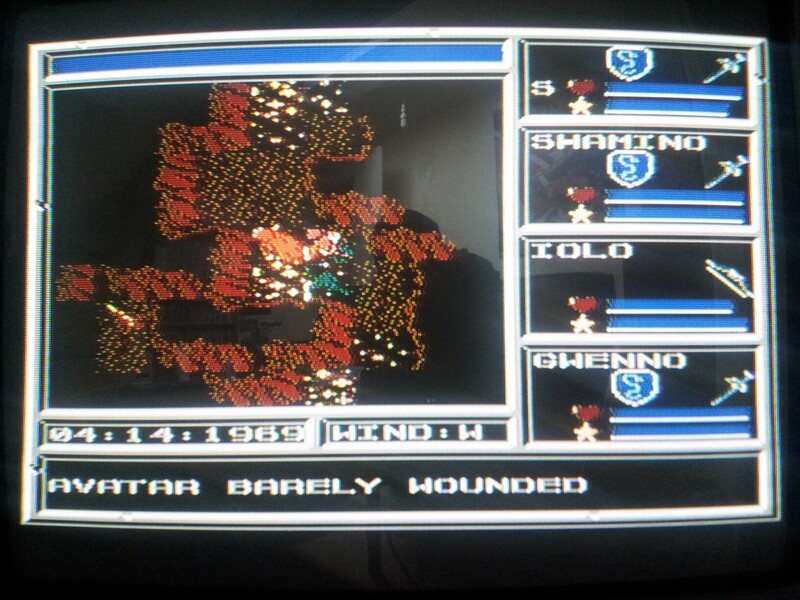 The towns aren’t even affected by the Shadowlords unless I’ve been extraordinarily fortunate to miss them every time. Something I should correct from a previous post is that I discovered that food does have a use being eaten each time my party sleep in their tent. Without it I don’t heal making food pretty essential as I discovered when I ran out. The combat has proven tricky on occasion although I’ve not gone out of my way to get any decent equipment which would no doubt help. The shrines usually have some tough creatures on hand but I’ve been able to dash in and out if needed on the magic carpet. I ran into an interesting bug where my Avatar turned into a ghost after being hit but I wasn’t returned to Castle Britannia to be resurrected and could carry on playing with none of the monsters able to attack me. I was sorely tempted to stick with this but with only one save slot on the cart I figured I should stick with the regular approach in case I ended up running into a showstopping bug when in ghost form. 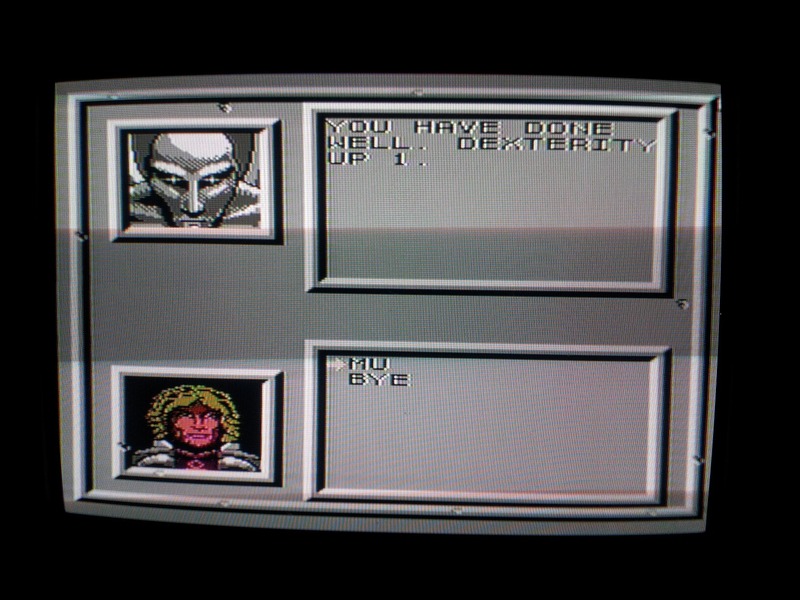 I reckon it’s safe to say by now that this particular Ultima 5 isn’t very good. It’s not offensively bad (at least with the sound off) but there is nothing much to make me want to keep playing. 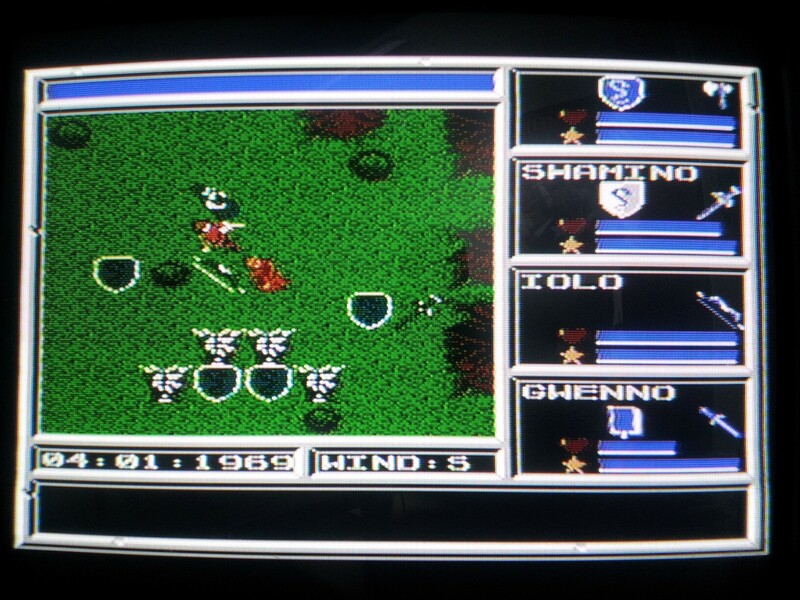 This Britannia is bland, basic and more than a little boring and I’m wondering why I didn’t go for Ultima 4 on the SMS instead. I’m hoping some dungeon exploration will liven things up. Apologies again for the brevity of this post and any worse than usual grammatical errors that may have slipped through. My usual PC is currently out of action and I’m typing this up on my TV which isn’t easy to read at this distance + the small form factor keyboard is determined to make me overwrite text by placing an up button where the shift should be. What caused this is that after 10 years of faithful service the PSU in my gaming/office PC went out in a ball of smoke a few days back. I had been weighing up whether to swap it before getting a new GPU but this decision has now been made for me. Hopefully it didn’t take anything else down with it but I won’t find out until I pick a replacement up later today. There is a new GOG installer out for Ultima 7/Serpent Isle and I’ll be churning out an updated Ultima Patcher as soon as I’m up and running again. Lastly, I’ll give a quick plug for the Crusader fan site Echo Sector which has made a welcome return after being down for about a year. It should be returning to it’s place in the links on the right hand side shortly after I post this. 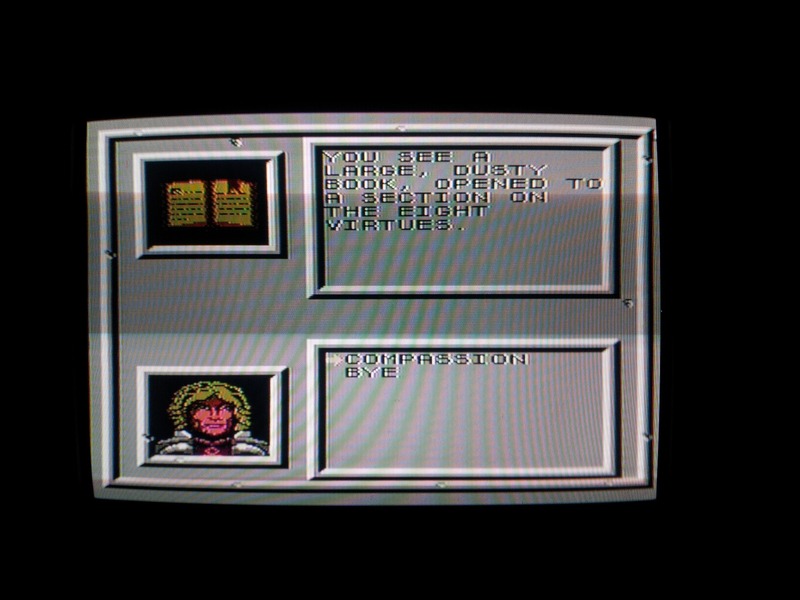 I’ll start this post by talking a little about the interface in Ultima 5 which so far hasn’t received much of a mention. 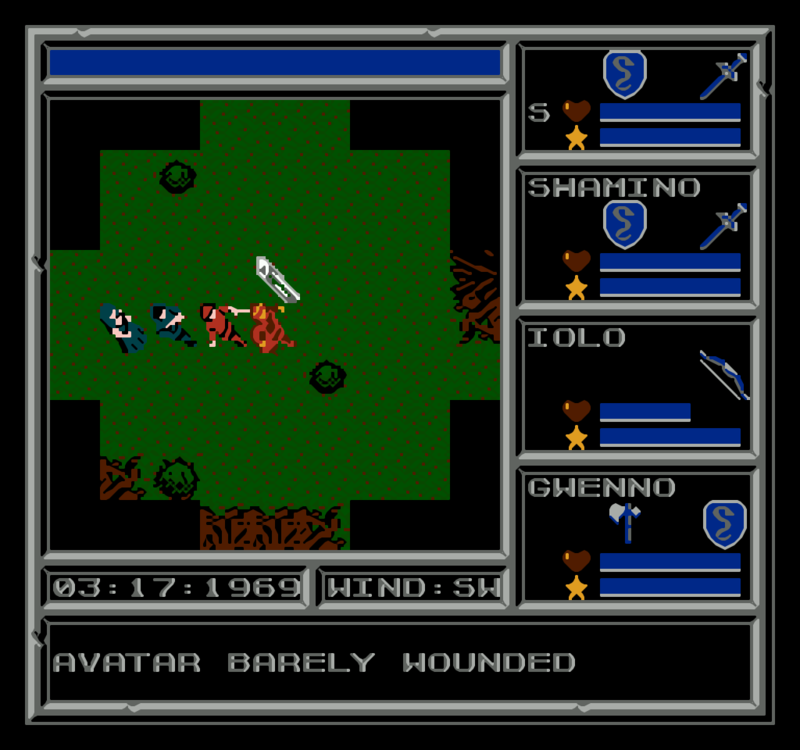 Each character has 3 inventory slots – one for armour and another for each hand. Other than equipping them, I’ve no control at all over the other party characters who follow along behind me (most of time) and fight automatically. 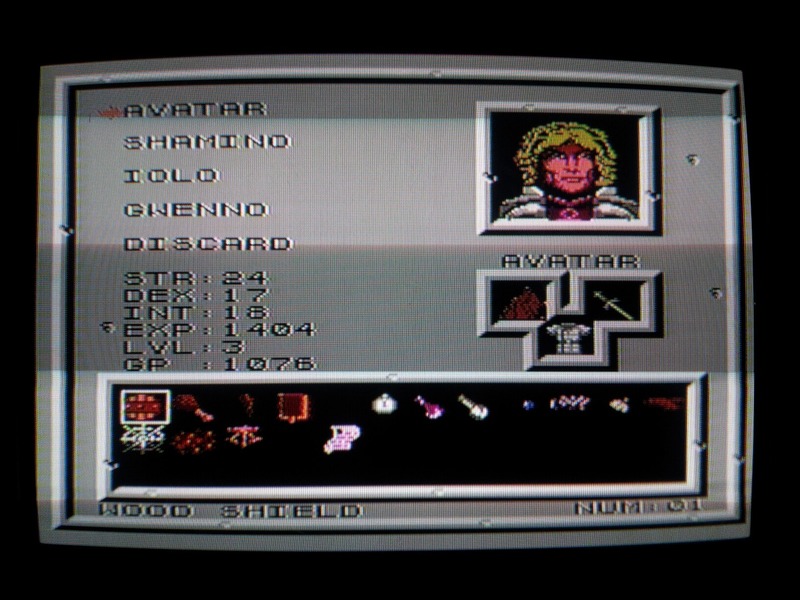 In the case of the avatar I can use whatever items I have in either hand at any time with the A button whether it’s a sword for combat, a tent, a spellbook, etc – every action works this way. The start button brings up the inventory shown above which allows me to select which items I’m carrying. It would be a whole lot easier if I could use items directly from here rather than having to equip them every time. E.g. Every time I want to use the tent to recover/save the game I have to first equip it and then swap back to my shield again after. This is relatively quick at least and I can live with it. 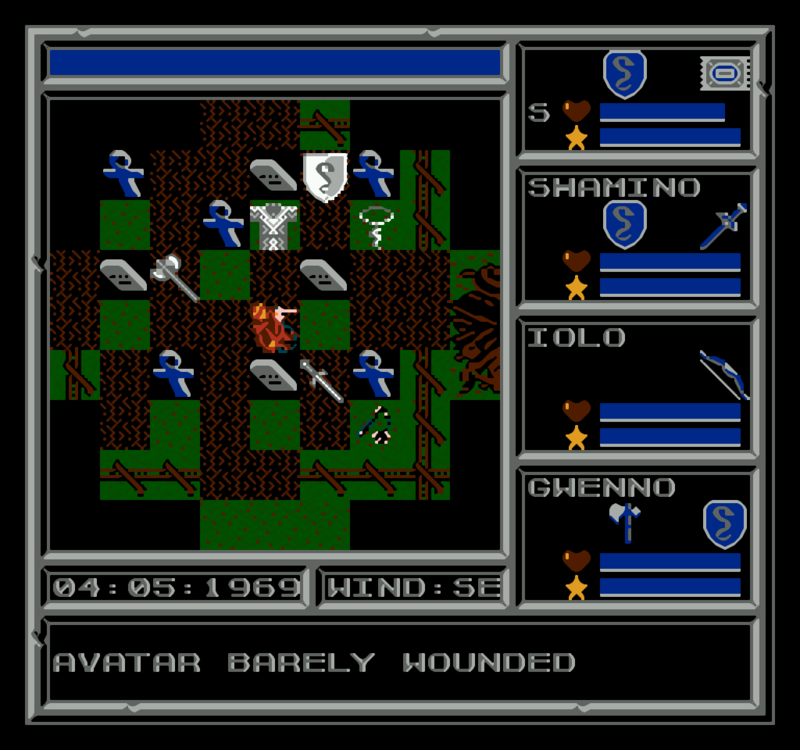 It’s obviously a huge simplification from the way the real Ultima 6 engine worked and the inventory shown is a shared one so I can’t use my party as pack mules. The B button is kind of an ‘interact with world’ button to talk to anyone or pick items up. Finally the select button allows me to see individual stats. I notice in here that my party members don’t level up and will be as they are for the whole game it appears. In general, the control scheme works OK. The difficulty lies with the unresponsive nature of the game which can take a while to pick up that a button has been pressed at all. I’ve found happens less on real hardware than on emulation but it’s far from speedy. There are strange quirks also like characters blinking in and out of existence when I have a cursor up sometimes, presumably breaching a sprite/memory limit. 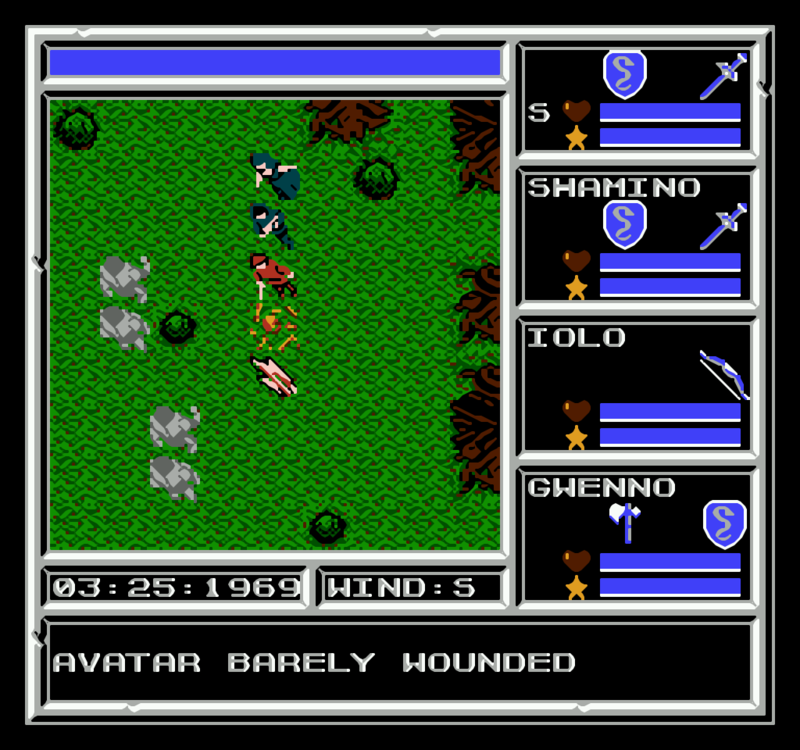 A big plus for me is the Ultima 6 type combat where I only have to worry about the Avatar and the rest of the party look after themselves. It means I can spend a lot less time fighting monsters and more time exploring. As far as I can tell, the monsters on the map are all preplaced and will respawn the moment the moment the appropriate tile is on the screen which can be a pain if you walk back to an area you cleared 5 seconds ago. There doesn’t appear to be any penalty for sleeping in the tent after every battle so I’ve not struggled too much on this front yet. To get back to the playthrough, my main aim was to find a boat and start completing shrine quests. I headed South from Britain via Paws, Trinsic and eventually Serpent’s Hold which is connected by bridges to the main land mass in this version. The towns were more populated than Britain had been with maybe 5 or 6 people in each – not exactly a bustling metropolis but the core of the conversation gameplay mechanic is still there. It’s massively oversimplified on the NES with everyone throwing clues at you and little else and subsequently massively easier than it was on PC. I’m not sure how much sense I’d make of all this if I didn’t already know the plot either. I buy a skiff for the bargain price of 100 gp in Serpent’s Hold and set sail. The skiff can go anywhere in this version with the limitation that the world here has edges removing some of the shortcuts. This is a pity as those shortcuts would be useful with a game that runs at this speed. The skiff does have the advantage of being carryable through moongates which may offer a shortcut for all these shrine quests. When I get to the Isle Of The Avatar, I originally thought I must be in the wrong place as I was face with a building and a locked door. I had to pick the lock to get in, then use a skull key (bought in Serpent’s Hold) to get through another and then found the codex in the next room. It’s about this time that I realise that none of these items I’ve just used wear out so when I bought a pile of lockpicks expecting to need them all and more later in the game, I may as well have bought the one. Similarly I bought a load of food at one point but it doesn’t seem to serve any purpose – I might gain some health for eating it but I can use my tent at any time for that anyway. Aspects of the game like this do make if appear to be somewhat incomplete. On those lines, there are poison fields everywhere except they look practically the same as the normal ground making it all too easy to get poisoned by mistake. There is no animation for arrows either so we get a sort of travelling sparkle effect in combat all the time which looks quite strange. After completing my first shrine quest I head for Yew. This seemed like my best bet as I’m trying to join the resistance and was told in Britain to ask at the Arms Of Justice. I learn the password here as well as the mantra of Justice and am planning on tackling that shrine quest next. I’ve had a good bit of time with this game now. It certainly improved with the sound off and is considerably better than I was expecting. The Ultima 6 engine produced my favourite games in the series and the idea of Ultima 5 being ported to it holds a lot of appeal. I wish it had been done on a more powerful system as the NES clearly wasn’t up to the job but it’s not so far off that there isn’t still some fun to be had exploring the world and towns. I expect my patience is going to be tested severely going back and forth on all these shrine quests next – I’ll be lining up a stack of podcasts to get me through it.